Delicious Scottish pure butter cookies flavoured with cranberries and raspberries and white chocolate chips. 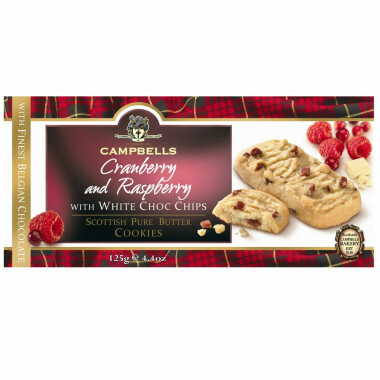 A wonderful combination of white chocolate sweetness with raspberry and cranberry tanginess that leaves a delicious fruity flavour in the mouth! Ingredients: wheat flour, butter (28%), sugar, white chocolate chips (3.4%) (sugar, whole milk powder, cocoa butter, soya lecithin, natural flavouring), cranberries (2.8%) (cranberries, sugar, sunflower oil), raspberries (1.1%), whole milk powder, natural flavourings, salt, raising agents (sodium bicarbonate, ammonium carbonate). Allergy advice: contains wheat, soya, milk, gluten.